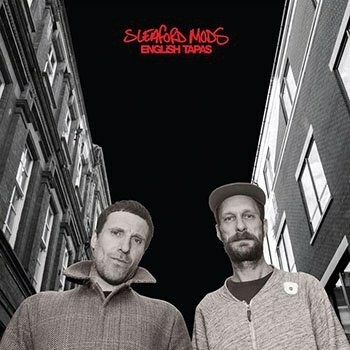 Sleaford Mods call their music "electronic minimalist punk-hop rants for the working class." On their newest album, they are as aggressive, unpolished, and totally unapologetic as ever. When you first hear Sleaford Mods, you might be a bit disoriented. The Nottingham duo's electronic minimalist rap-ish rants are insulated against the uninvested listener. You need to seek it out and you must have a reason to dive into it. This self-isolation may be why it's taken them so long to expand their fanbase. You have to understand the cultural context of their music. You have to have some stake in the subject matter to make Jason Williamson's aggressive delivery sound like anything other than an angry, yelling, Englishman. The sound of Sleaford Mods is predominately based around Andrew Fearn's grimy, post-punk loops. He builds a mesmerizing, repetitive darkness that stews underneath Williamson's fast talking or static, off-kilter singing. But English Tapas follows the expansion in sound that was established in their 2015 album Key Markets. The duo are playing more with melody and tonality, adding some complexity to the instrumentals even in ways as simple as the drums dropping out on the choruses of "Army Nights" or the snare build-ups sprinkled through "Carlton Touts". More or less, though, Fearn sticks to what he knows: gritty, post-punk bass played on top of hammered-out, four-on-the-floor drums ad nauseum. The simple descending bass line running over and over on top of a monotonous two-step drum beat on "Just Like We Do" is the kind of Sleaford Mods track that's so basic the ear wants to tune it out, but that is the genius of the duo's minimalist leanings. Regardless of the simplicity or the repetition, the elements refuse to be ignored. Little flourishes of keyboard add a hint of variety, but the unflinching consistency on tracks like "Messy Anywhere" and "Time Sands" is crazy-making and unapologetically so. Like a juggernaut trudging ever onward, unimpeded by anything in its way, Fearn's beats slog along with eerie determination that repeats itself until you start paying attention. Williamson matches Fearn's relentlessness at every turn with fast-talking raps that don't even pretend to fit into a rhythmic mold. "Snout" finds Williamson initially starting to sound like he'll try and speak metrically, but two lines in he's just shouting and even his double-tracked shouts for emphasis can't keep up with his diatribe. There are internal rhymes and some arbitrary, subtle poetic form, but Williamson is more concerned with the mood and the performance than the technique. But Williamson also sings more than usual onEnglish Tapas. Sometimes his singing is tuneless and used mostly to create an odd, manic atmosphere like on "Drayton Manored". Other times, like "I Feel So Wrong", are earnest attempts to form a melody around Fearn's sharp bass lines. His aggression and refusal to sound like anyone but himself are still there, but he's trying to do something different than just shout at you. The most distinctive characteristic of Sleaford Mods seems to be that they don't have notions about their place in the musical world. They are 40-something weirdo's making angry, simple music that a lot of people will see as too harsh, too odd, or too simple. But they don't care. When Williamson's singing drifts out of tune or he runs up to a high note he has to strain awkwardly for, he's not bothered. He barrels through and says what he means to say. Fearn's instrumentals don't for one second pretend to be anything more complicated than four-bar loops that require him to press play and not much else. In "Snout" Williamson gripes about wasting money on a sweater that he doesn't like and spews a line that seems to encapsulate the motivation behind the duo's who-cares attitude. He says "It felt like I was trying to be trendy when I'm not!" There are no illusions in this music. If you don't get it or you don't have any stake in it, there's the door. So what if it's not perfect, so what if it's not full of polyrhythms and tonal shifts. This music isn't about that, it's about being sucked in to a dense vortex of grimy drum 'n' bass and pissed off ranting and bobbing your head and being pissed off right along with it.